« Love These Vintage Neon and Bulb Signs! I love the contrast with the orange in the foreground and the sky in the background. I checked out Nicola’s blog. Beautiful work. Thanks so much — Nicola’s work is terrific! On the photo, that composition of colors and textures presented a perfect seaside moment! Great capture! Love the orange contrast. Excellent combination of photo and words, congratulations. It brings to mind The Sloppy Buddha blog, also on WordPress, do check it out if you don’t know it. Penny, thanks — for the comments and for mentioning that other blog, which I had not heard of and which I will visit. This painting (?) looks so real. Weeellll…. I’ve been fooled! Then you are a good photographer, Brett. Wonderful combination of image and words. Rather special to have met the person who came up with words that work so well. Kindness is the most important thing. Simon, thanks. Yes, in person Nicola matches her words — a good way to be. Wow!! Thank you for letting me find you!! I am so going to enjoy your blog!!! Kejimkujik…wow, this is a place I visited ages ago and loved! I so rarely see/read anything about it. Your photo and the inspiring message are wonderful. Great blog. Thanks for visiting Writz of Passage. Caroline, thanks. 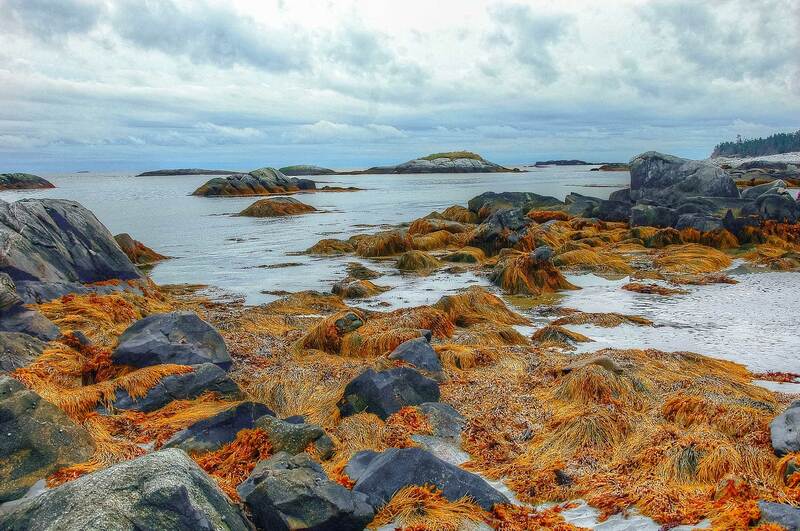 The main part of Kejimkujik is off the beaten path and the seaside portion even more so. Enjoyed your Writz of Passage. Continued safe and good travels. That picture would be in my PFH file–Print, Frame, Hang. Beautiful quote! Saving it to my “Quotes to live by” file. Thank you for creating bringing home onto my computer screen Brett! And thank you for stopping by my blog as well.